It’s no secret that real estate values are at an all time high in the greatest city in the world (That’s Charleston in case you had any doubt). With that comes elevated rental rates and investment property ownership has never looked so good. The savvy investor understands that it is important to do everything possible to get the highest rental rate for their property that this elevated market can bring. Here are 5 easy tips to get the most for your property. It goes without saying, but I will say it anyway. Do not put off to tomorrow what needs to be done today. Not replacing air filters, or faulty appliances, or fixing minor plumbing or electrical issues only defer the inevitable repair to the most inopportune of times. Typically, these issues manifest themselves when you are trying to market the property or when the new tenant moves in. This can start a new tenancy on the wrong foot and the relationship can be rocky throughout the term of the lease. Keeping your property up to date, please… pretty please. This (among other areas) is where a property management company can come in handy. The most critical time for an investment property is when it is being shown to the market. After the property is brought up to date and had all of its necessary repairs done, it’s time to get the word out! A property management company should have a multifaceted and aggressive approach to getting as many people looking at that rental property as possible. In short, they should do more than just throw it up on Craigslist once and lease to the first person that calls them. I tell our clients that I am going to be showing their house so much that they are going to think about charging me rent! Getting this right is critical because you only have one chance to make a good first impression. At Bridgepoint, we pull multiple comps, look at the historical trends of the zip code the property is in as well as neighboring zip codes, and then come to a decision with you. The problem with pricing too low is obvious but you might be asking yourself, “Why not ask for a lot? What if someone pays it?” I love the enterprising spirit, but tenants are savvier today than ever before. They know when a rental rate is too high and if they see it go down 2 weeks later, they wonder what happens if they wait another 2 weeks. Then their interest drops or they move on. Pricing is critical and Bridgepoint would love to help you price your property right. It’s important to do your due diligence and qualify potential tenants. Have a set of parameters and do not deviate from those parameters. Having something written down is a great idea. 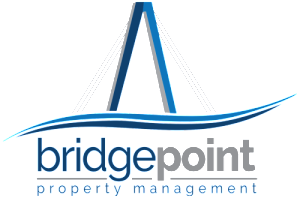 At Bridgepoint we do credit checks, background checks, eviction reports, rental history verification, employment and income verification, as well as a tenant interview. It is so important to be diligent and have a level playing field for all tenants. Just the title puts me to sleep but it is critically important to know that both of these things change the moment a property goes from being owner occupied to an investment property. You would be well served to contact the county tax assessor and understand what your exposure is. The good news is that insurance typically goes down in this case. Bridgepoint would be happy to help you with this too. Having investment property is just that, an investment; an investment in time and money and effort. Like most things in life, you get out of it what you put in to it. If you neglect one or all of the above points, you could find that you have made a bed that you do not want to sleep in. On the other hand, if you are diligent in your investing, it is likely to pay dividends for years.